NEWPORT BEACH — Several boxes were checked off on the lengthy list of objectives that helps to guide the Newport Beach Harbor Commission, during its July 10 meeting. “While we did not achieve progress on each objective, I feel that we made progress on what were our key objectives,” said Harbor Commission Chairman Doug West. Investigate potential solutions to the permitting process and lack of small-scale dredging operators: The Harbor Commission Dredging Subcommittee — composed of commissioners West, Duncan McIntosh and Brad Avery — has been leading efforts to make it easier for slip and docks owners to perform maintenance dredging around their private docks and piers. The current Regional General Permit (RGP) 54 expires in March 2014. Recommendations for the 2014 permit would increase the dredge depth to -10 feet plus 1 foot, increase the per-address volume of permitted dredged material to 10,000 cubic yards and increase the annual harbor limit to 150,000 cubic yards of dredged material. Earlier this year, Newport Beach City Council approved funding to jump start the initial stages of permit acquisition. The council approved $100,000 in funding for the selection of a consultant, who developed a sampling and analysis plan for sediment testing and permit submittals. Sediment sampling in the harbor began this month. A second component to the RGP and a key provision of the current permit — one that restricts dredging within 15 feet of eelgrass – is the incorporation of the Eelgrass Protection and Mitigation Plan for Shallow Waters in Lower Newport Beach (also called the “Newport Specific Plan”). The standing permit allows property owners to dredge limited quantities of accumulated sediment from under their docks — a maximum of 1,000 cubic yards per address and a maximum of 20,000 cubic yards for the entire harbor — with dredging permitted to -7 Mean Lower Low Water (MLLW) with 1 foot over dredge. The recommendations must be approved by three agencies: the Army Corps of Engineers, the California Coastal Commission and the Southern California Regional Water Quality Board. The city is working to get a new RGP approved and in place by April 2014. “The Newport Specific Plan will be presented at a meeting July 30,” West said. Newport’s plan would work off a “threshold” table that would identify a specific amount of eelgrass in Newport Harbor’s shoreline and dock area that would be deemed healthy or acceptable for the harbor. Once a healthy or sustainable amount of eelgrass has been identified for the harbor, dredging and dock replacement activities could occur without mitigation measures, as long as the “threshold” level of eelgrass maintained in the harbor was not lowered. Harbor commissioners hope the Newport Specific Plan can be incorporated into the new California Eelgrass Mitigation Policy. The new plan is expected to be approved in 2014. Although it is independent of the RGP-54 permit, the program could be used for both RGP-54 and non-RGP-54 projects. Investigate Possible Uses for the City’s Lower Castaways Property: Subcommittee members Dave Girling, Avery and Karen Rhyne intend to hold a second study session where the public can share their ideas on how best to utilize the Lower Castaways parcel — the last remaining piece of undeveloped city-owned waterfront property. The subcommittee hopes to provide answers to the question of what should be housed on the site that the city acquired from the Irvine Co. in 2008. The subcommittee has met with city council members, City Manager Dave Kiff, Parks and Recreation staff members, harbor resources staff members, city staff members, business owners and others to gather ideas. Located on East Coast Highway near the bridge next to Dover Drive, the 4-acre waterfront site provides access to Lower Newport Bay. It holds potential for marine-related services, such as a launch ramp or boat storage facility. Other suggestions include establishing a hub for cyclists, hikers and boaters on the site; or approving a coffee hut or restaurant where people could meet before or after a bike ride, a hike or a day out on the water. The city’s Parks and Recreation Department has agreed to form a subcommittee to collaborate with the Harbor Commission on potential plans for the site. Additionally, Kiff agreed to provide resources and funding to create plots and plans for potential bike trails, and a dock with a public pier for human-powered craft, to get a sense of what that will look like, Commissioner Girling said. A study on the bulkhead, traffic patterns and assessment of plumbing and electrical facilities will also be conducted. The subcommittee will report recommendations to the city council once it has explored various ideas. Evaluate the Placement of Existing Piers: Harbor Commissioner Blank will bring recommendations back to the commission in the upcoming months. At that time, commissioners will vote whether to present the recommendations to the city council. 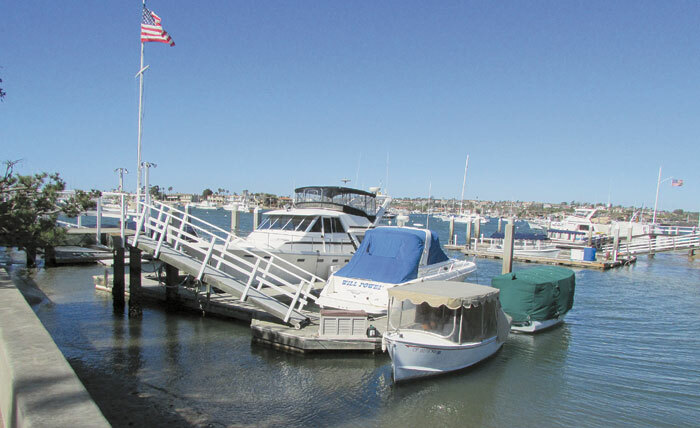 At a previous meeting, Blank and Girling presented recommendations on how the city could make harbor piers and docks more welcoming to visiting boaters. They recommended the construction of additional piers and ways to facilitate visitor access. Additional piers were recommended to be constructed at Lido Marina Village, Balboa Marina, Lower Castaways, the northwest base of the Lido Isle Bridge and the east end of the Balboa Bay Resort property, with pedestrian access to Coast Highway. While several of the public piers are ideally located near these facilities — such as the pier at the Fun Zone, Fernando and 15th Street piers, the Coral Street pier, the Rhine Wharf dock and the pier at 19th Street — additional piers should be added. Promote Newport Harbor as a Desirable Destination for Cruisers: This may come in the form of a Harbor Summit, to establish a unified approach to efforts. The subcommittee will pursue the concept and bring back recommendations to the commission. Harbor commissioners are working with the city manager and Visit Newport Beach on the concept. The Harbor Commission will present its 2013-2014 objectives to the Newport Beach Tidelands Committee on Sept. 18. In other news, commissioners elected Duncan McIntosh as the new Harbor Commission chairman. Brad Avery was selected as vice chairman and Paul Blank was named secretary. “I am humbled by the responsibilities bestowed upon me and I hope to meet the standards set by outgoing Chairman West,” McIntosh said. Newly appointed Harbor Commissioner Joseph Stapleton was welcomed to the commission. The financial adviser has lived in Newport Beach since 2006. Commissioners also asked Harbor Resources staff to work with Dave New of Basin Marine to figure out how to accommodate a marine tenant’s request to bring a vessel over 220 feet in length into the harbor in October. The Delta tri-level mega-yacht is expected to stay about one week in the harbor.